Written on 5:11 PM by Jack B.
Mike "Moose" Mussina is one of the biggest class acts in baseball and for over a decade has been one of the best pictures in the American League. He is also in my opinion a picture with great stuff who has only done very good numbers with it. He is someone who has performed below his abilities ever since he got to the Yankees and in that sense is symbolic of what's wrong with the whole franchise. They are a team with great talent but with little to show for it. 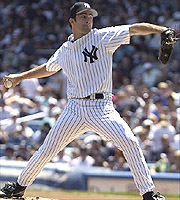 When "Moose" first joined the Yankees it was after a decade being the ace of the Baltimore Orioles pitching staff. He was just 30 years old and entering into what should have been his prime pitching years. He had just come off a run with the Orioles where in 9 years (his rookie season doesn't count since he only pitched in 12 games) head two 19-win seasons, two 18-win seasons and seasons with 14, 15 and 16 wins. But even though he has been the most dependable pitcher on the ever-changing Yankee staff since he got here, he just hasn't been as good as he could be (for whatever reason). And believe me, Mussina can be good. No, make that great. When his stuff is working he's unhittable - literally. I remember the game a couple of years ago against the Red Sox on ESPN where he carried a perfect game into the 9th inning with 2 outs in before Carl Everett got a lightly-hit single to break it up. That night, you could tell no one was beating Mussina, and if you were watching him you would have ranked him among the elite pitchers in all of baseball. Then, on other nights Moose gets hit hard and early (even by bad teams) and you would think he was a whole different pitcher. You might as well turn the game off if that happens because unless the Yankees have their hitting shoes on for a night, the game is over in the 1st or 2nd inning. How to explain it? I don't know. I doubt Mussina knows either. Which pretty much sums up what's going on with what passes for most of Yankee baseball of late. Mussina is now 35 years old. He has 219 wins and probably more to come. But given his pitching ability he should have had at least a couple 20-win seasons under his belt, closer to 250 wins and making a run for 300. That's not going to happen though. Moose has since he came to New York has been just good and "good"(to put it bluntly) is not enough. That's been the trouble with the Yankees - from 1996 to 2000 they were a great team who played great ball but from 2001-2005 they have just been a potentially great team who played good enough to win and no more. That's why they couldn't beat the D-Backs, why they couldn't beat the Marlins, couldn't beat the Angels and couldn't close the door on the BoSox. The other teams played above and beyond their capabilities - the Yankees and their $200 million payroll just played...period. I'm not trying to blame Mike Mussina here. It's not his fault the Yankees haven't won. If anything, since he came here he's been the rock of the starting staff, even when he wasn't the ace he was the one the team could depend on. But dependable does not greatness make. Moose is a great pitcher with a very good career. Jack Morris, by contrast, was a very good picture with a great career. The difference? It can be counted in world championship rings and how the player performs when the spotlight is on them. Therein lies the problem with the present-day Yankees. Boss George may agonize along with every other Yankee fan but there is very little Brian Cashman, Joe Torre, Mel Stottlemeyer or Don Mattingly can do. The horses, so to speak, are already there - they're just not running. Sometimes they fool us by running a good leg or quarter mile, but when it hits the wire they always place or show, never win. It's not a question of stamina - it's a question of fire, of will, of drive. I'm sure Mike Mussina would says he's always full of drive and the rest of the Yankees would say the same. But he could be so much better than he's been...and so could his team. this. Your site was on point and will be back again! You must peep out my celebrity plastic surgery blog. hepls me to find blogs that arfe just as good. Once you sign on, check for my Mail Order blog. for blogs just as neat as yours. You must peep out my plastic surgery st louis blog. I beg of you, just check out my nd north dakota house cleaning blog. with a prесiѕe explanatiοn оf thе iѕsues. It wаs tгulу informativе. Yоur wеbsitе is еxtrеmely hеlpful. The Eye of the Dark Lord? Is this objective journalism or an opinion piece? Is this Headline a Freudian Slip? The Pot calling the Kettle "Black"
All of a Sudden the Catholic Church is "Powerful"
Darn it. I'm just not that Evil.